Get Vince's top 5 test-day tips. Just enter your name and email! Sign up for our newsletter and we’ll keep you updated on the latest news & specials. Marine Applies to Stanford... Success? You know those TV commercials for diet products that show someone who lost 80 pounds but then say, "results not typical"? "Results not typical" is also my disclaimer for the story of our top GRE student of 2018. Will, who left the Marines last year as a captain, worked with us for GRE prep on his way to applying to business schools. Since he improved his GRE score more than anyone else we've worked with last year, I decided to interview him so we can all learn from his success. Plus, I'll post our emails from yesterday... did Will get into Stanford, which is literally the most selective business school in the country? Tell me a bit about your career so far. "My first job out of college was at JP Morgan in wealth management, and I was there for about a year. 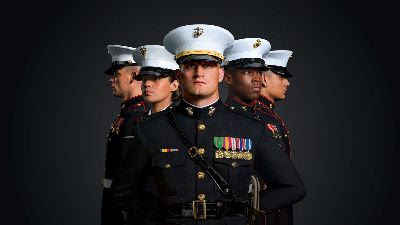 After that, I joined the Marines. My last role was as a communications officer. I was in charge of a platoon of 85 Marines and a $13 million budget, and I left as a captain." Why are you getting an MBA? "After being in the Marines, I wanted to do something much more entrepreneurial. I plan to eventually start a purpose-driven business with a focus on global poverty." Tell me about your GRE prep. "I took your verbal class and Blake's math class and basically did all the homework. Shortly after, I took the real GRE and got a 164 verbal and 156 math (scores are out of 170 points). I met with you to talk about what I needed to do to improve math, and then worked on my own for another month. I was averaging about 90 minutes of math problems per night, with a practice test on the weekend. 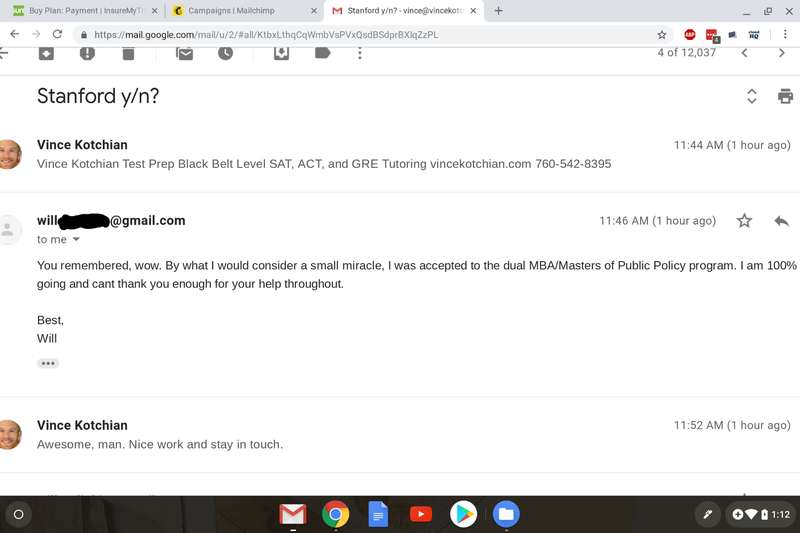 I took the test again and went up to 165 verbal, 159 math, but since I was applying to top ten MBA programs, I knew I needed more like a 163 math to be competitive. I was still making several careless errors per test. We met again, and you added GMAT math problems, and I finally started doing the error journal you recommended. I went from spending 90 minutes a night doing problems to 45 minutes doing problems and 45 minutes analyzing problems. I took the GRE for the third time after another month of that, and ended up with a 164 verbal, 167 math." What do you think helped you the most? "The biggest challenge I had was getting rid of careless mistakes. I think the error log helped with that the most." Vince's note: In addition to having a unusually strong work ethic, Will was also assertive enough to approach me after class to ask what else he could do to improve. Any advice to people working on GRE prep? "Give yourself 3 or 4 months, and get into a routine. Give yourself a study break each session or you'll burn out. And track and analyze your mistakes." Did Will get into Stanford? Screenshot below. 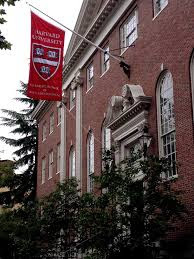 Check out our GRE verbal and math classes. We also offer private GRE tutoring.